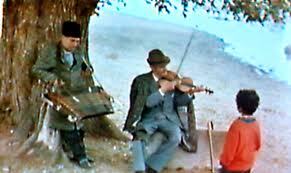 The movie, “Latcho Drom” (safe Journey), is a musical travelogue that uses music instead of spoken words to evoke the history of the Romanian people. It is a rare movie in many cases; it breaks the fixed parameters of a documentary or a feature film. Very few dialogues, no interviews, and a harmonies orchestra of music and songs from the different part of the world in different languages make it a unique movie. The French-based, gypsy film-maker Tony Gatlif shot Latcho Drom in several countries, with an almost entirely gypsy cast. 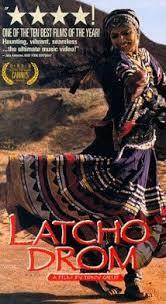 In fact Latcho Drom is a film that, as American critic Jonathan Rosenbaum put it, “has no nationality at all”. It is also a film without fixed genre: at once musical, documentary, travelogue, ethnographic essay and impassioned manifesto for a freer cinema and a freer life. It opens with a band of Indian gypsies, or Rom, crossing a desert and then settling down beneath a tree for an extended ritual. For these people, music, song, and dance are the means for life. Without narration or dialogue, the film moves next to the slums of Istanbul, and then to Romania where an old man chronicles in a ballad the downfall of the dictator Nicolae Ceausescu. An elderly woman sings about those who lost their lives at Auschwitz. In France and Spain, gypsies express their joys and sorrows, the ups and downs of their traveller existence as outsiders. 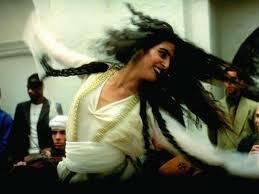 This hypnotic film, with its passionate dance sequences and its great music makes it such a masterpiece. Music is no doubt the most important part of this film, but instead of music the director and his technical team have also worked very hard on the visuals and sequences of the scenes. Its beautifully captured portraits, composition of contrast colors and scenes takes you in such a dreamlike time that you can’t get out from the magic of this film for a while. History of the Romanian gypsies and the nomadic culture is a long debated and controversial topic among the historians, cultural theorists, researchers and anthropologists, and in this film the director has just tried to connect and locate the pathway of the journey of those ancient Romanian people who started their journey from the north central India and after crossing many countries and continents they are living in the countries of Europe. No doubt this film is an absolute and ultimate masterpiece about Gypsy community, being the world’s oldest travelling community A Gypsy is “any member of a dark Caucasoid people originating in northern India but living in modern times worldwide, mainly in Europe,” the Encyclopedia Britannica defines, “It is generally agreed that Gypsy groups left India in repeated migrations and that they were in Persia by the 11th century, in southeastern Europe by the beginning of the 14th, and in western Europe by the 15th century.” Broadly speaking, this last sentence provides a geographical synopsis of Latcho Drom, which begins in northern India (Rajasthan) and proceeds through Egypt, Turkey, Romania, Hungary, Slovakia, France, and Spain. 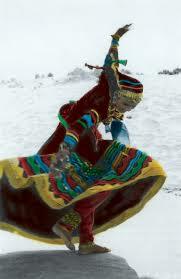 In each country we find Gypsies making music, and often dancing. In my personal view “Latcho Drom” is a cinematic poem to Gypsy culture a symphony of their music, songs, arts, and mainly their will to live and survive happily and enjoy every movement of life even in the worst times.